In evaluating a FCAW weld cross section to AWS D1.1:2010, the weld engineer has asked that the CJP groove weld be evaluated by 4.9.4.1 for PJP. This is a requirement that the weld engineer has asked for. 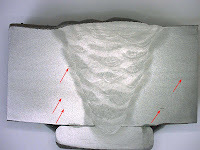 The Macro weld cross section as evaluated, revealed anomalies in the base material (A36), see photo. In the cross section the base material shows laminations. Under higher magnification the laminations (or tearing/crack) in base material are confirmed. The laminations have to be considered a Crack and rejectable per 4.9.4.1(a) and the weld engineer’s requirement, correct? Leave it to me to be the dude that disagrees with the engineer. Breaking my first "cardinal rule" of weld inspection (CR-1: Never evaluate a weld from a photo), the anomalies you've noted are not in the weld. Nor are they (with the exception of one) in the H.A.Z. (heat affected zone). Nor do they run in a direction which would suggest a welding related problem. These laminations should be evaluated per the material specification of the base material (ASTM A36). That should be the criteria used to determine acceptance. On the other hand, the beauty of being the "Engineer" is that your word is final. So if you're asking me, I say this weld is acceptable and the laminations should be evaluated per ASTM A36, but you go with whatever the Engineer determines. Why do good Welders fail weld tests? Some time around 1981 I completed technical school and was given the opportunity to take my first Welder Qualification test. Cyde Iron Works in Duluth, MN was hiring. Passing meant a $12hr opportunity to join the USWA Local 1424. At that time, unemployment hovered just over 9%. The 4 tests consisted of unlimited thickness, 3G and 4G tests with both Flux-Core (FCAW) and Stick (SMAW). This was the opportunity I had spent the last year training for. I was at the dinner table when the 3rd shift Foreman called to let me know I had failed the 3G SMAW test. I was devastated. Three days later my instructor called to say they were allowing me a retest. • Nerves – There is a lot on the line when a Welder enters the test booth. Maybe they’ve been out for a while and finances are tight. Maybe there are 20 Welders competing for 2 positions. Maybe passing gets them that much needed raise. What ever it is, chill-out. A welder qual test is no different then the work you’ll do every day. You wouldn’t be in that booth if you weren’t ready for it. • Prep – There is a lot riding on a Welder Qual test, so make it count. Remove any flame or plasma cut surface from the groove face. Remove any mill scale from the plate surface for at least a ¼ inch from the joint. If the bevel does not require a land (root face), insure you grind it to a knife’s edge. If the bevel requires a land, make it consistent. Remove any mill scale from the backing plate. That joint should shine. • Technique – Use ALL your best practices. If given a Weld Procedure (WPS), read it! What should your wire feed speed be? Set It! What should your current or voltage be? Set It! What should your flow rate be? Set it! You do that, and you’re dang near there. When given run-off tabs, use them! Backing bars should be 2 inches longer than the joint. That’s 1 inch at the start end and 1 inch at the finish end. Use them. 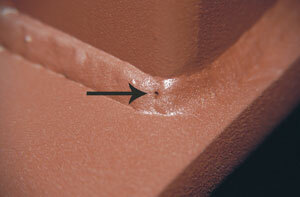 Starting a weld on a run-off tab allows your eyes to focus and the arc to settle down. Ending on a run-off tab insures you will fill the joint for its entire length. Don’t “break” the arc if you don’t have to. If you have to, break it in the center of the joint (I’ve said too much already). Bring a wire cutter and ALWAYS cut the wire (filler or electrode) before striking the next arc. Clean the Mig (GMAW) or Flux-Core (FCAW) shielding nozzle after every pass. When Tig (GTAW) welding, don’t allow the filler wire outside the shielding gas. When pipe welding, keep your tacks small. Grind them if they’ll let you. Maintain your purge. Remember, as you finish your root that purge gas needs someplace to go. Give it that opening. • Ask questions – Lots of them. Can I make adjustments to the machine? Can I use some practice material to adjust to this equipment? If I make a mistake, can I remove it with a grinder? What is the finish weld visual expectation? There’s a special place in my heart for good Welders that fail a weld test. But for your sake, don’t be that guy. 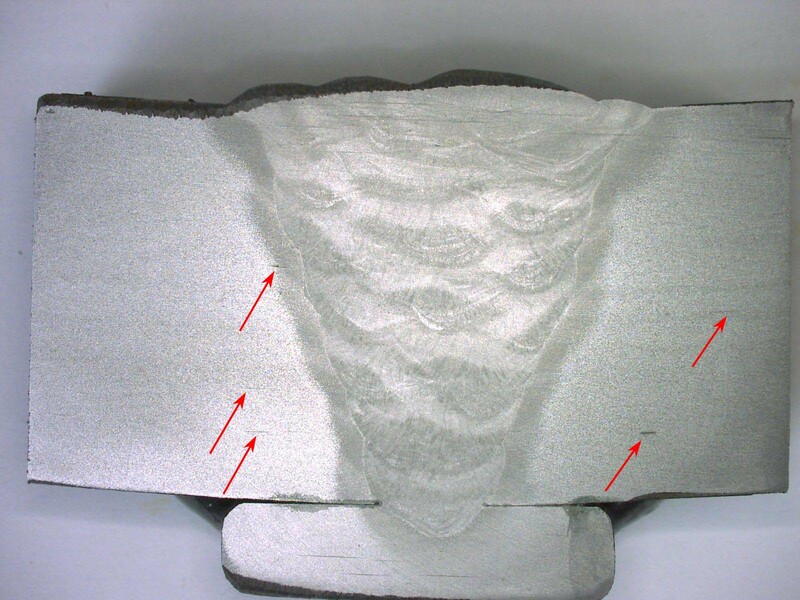 The company that I work for makes a single pass circumferential weld , on which at the tie-in on the weld completion, there is a minor tendency for a open pore in the weld crater. 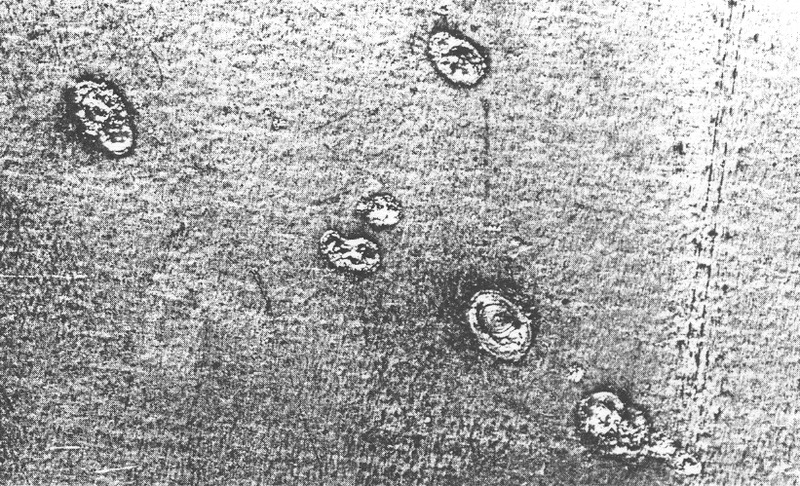 Investigation into this reveals terms such as a pinhole, blowhole, fisheye, or crater pipe are used to describe this condition. Historically, we have filled the crater and pore with weld metal and sent the product on for a paint application. More recently , the practice of filling the pore area with a non-metallic high temperature sealant has occurred. Our Engineering department deems this weld discontinuity as a cosmetic issue only, and thereby has authorized the usage of the sealant. a nonmetallic filler or mastic may be used for cosmetic reasons. Is the above application consistent with the intent of this paragraph in the commentary, or is it referring to something different? I can’t tell you how good it makes me feel that you would explore the Commentary to learn more about the codes intent. That’s what the Commentaries all about. I recently implemented this same repair at a local manufacturer. Their “old way” of doing business was to take a Mig gun to these pinholes and “Zap” weld into them. Their repair was taking a perfectly acceptable discontinuity and turning it into an Arc Strike. A big no-no in the wonderful world of welding. I’m glad you opted for the “Bond-O” over the “Arc Strike”. Good call and good luck. My name is Matt W. and I am a Manufacturing Engineer located in South Bend, Indiana. I am looking for some insight on the best approach to quoting weldments. (best practices and industry standards). I was hoping there might be a peer to peer group, or some related articles that I can access, to understand all of variables that go into quoting weldments. There seems to be a great deal of information about deposition rates and travel speeds (linear equations) but not a lot about the additional variables like clamping, part handling, cleaning, grinding, packaging, etc. This is what I am most interested in finding more about. Any information you can give me is greatly appreciated. I use a program that is simply an Excel spread sheet developed by a company called Sterling. The screen shots I’m attaching will give more contact info. For me, this has worked great. · 20% arc-on time – This would be a typical manual work cell that assembles, tacks and finish welds parts. · 40% arc-on time – This would be a typical manual work cell that receives a tacked assembly and finish welds it. · 60% arc-on time – This would be a manual work cell where the welder rarely moves, doesn’t add parts and is continuously welding. –or- This is a robotic work cell that welds many short (<4”) welds, lots of arm movement, lots of touch sensing. · 80% arc-on time – This is a robotic/automated work cell that completes continuous or multi-pass welds, does little touch sensing. Those are important rules. Get those wrong and you’ll never make money… and that’s why we’re here, to make money and keep folks employed. There are many Weld Calculators out there. This one works for me. I had an employer that would calculate weld cost by simply knowing the inches of weld on a weldment. They were very accurate, but a system like that would take years to develop… and theirs did. My advice, find yourself a Weld Calculator that you are comfortable with and use that. I’m not big on re-inventing the wheel. We are a “job shop” for the most part building aluminum, and occasionally steel, shipping containers. 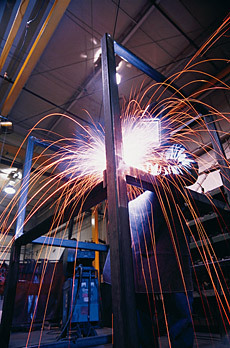 We have a steel job coming through calling for fluxcore welding. We would like to know if there is an equivalent/ alternative to fluxcore available? I looked over the equipment listed on your web site (removed-by PWC). I’m not aware of all the specifics of your situation, but your equipment list seems to indicate that your company would have no obstacles to using the FCAW (flux-core) process. On your standard GMAW (Mig) equipment it would only seem to be a change in welding electrode and shielding gas. The equipment may need larger drive rolls, liners and contact tips, but using the FCAW process with your existing equipment is a pretty simple crossover. You would need to qualify FCAW weld procedures and qualify those Welders (people) doing the work. If finding an alternative is a must, you might consider the GMAW process with a Metal-Cored welding electrode. Again, your equipment would be compatible. Your Welders (people) may already be considered qualified if they have qualified using the GMAW process with a solid electrode. You would still require a qualified procedure (WPS). The FCAW process and the GMAW (w/Metalcore) are fairly similar processes. Both use the same equipment, similar shielding and a tubular electrode. The FCAW process leaves an exterior slag deposit, the GMAW w/Metalcore does not. The American Welding Society (AWS) considers Fluxcore and Metalcore different processes. The Canadian Welding Bureau (CWB) considers them similar. Please remember, I’m making this observation with very limited information regarding the specifics of your situation. If you would like to further discuss this you are always more than welcome to contact me directly. I have a problem with the B31.3 code. It seems to be costing us getting jobs. Recently, we were going to do some copper brazing for a regular customer. When we made them aware of the requirements for pressure testing, they backed out. They didn't want to "go thru all that". This is not the first time this sort of thing has happened. Do we do the work anyway and allow them to "waive" code requirements, or loose the jobs to someone who will do it cheaper because they don't have the QC costs and don't go by the rules? Remember, “…to safeguard the health and well being of the public and to maintain integrity and high standards of skills, practice, and conduct in the occupation of welding inspection…” –AWS-QC1 Sec. 11. That is why we became Certified Welding Inspectors. People who have no clue as to what we do, trust we’re good at it, and are counting on us to follow through. Codes and standards are developed by people who work in our industries. 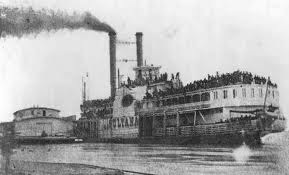 They are often the result of tough lessons learned over the years (Google: The Sinking of the Sultana). When referenced in contract documents they become law, and we need to adapt the entire code into our project. Loose the job or not, you don’t have a problem with B31.3, and you already knew the answer to your question… You play by the rules. Qualified per Clause 3? or Clause 4? I'm working with company that has their Welders certified on A36 plate with .045 solid wire. They have taken the test with GMAW, in a vertical down progression, in a globular transfer. They took it on 1 inch plate, Single V- Groove with backing. The company they want to do work for wants them qualified to do flat and horizontal fillet joints but says they are not qualified because they welded there test plates vertical down. “Who’s right?” My first reaction would be, "The Customer", but we're Inspectors so we’ll dig a little deeper then that. For the sake of this question I’m going to assume the qualification we’re discussing is to AWS-D1.1. When the Welders were tested they needed to be tested to a qualified weld procedure specification (WPS). They could not have taken the test using a prequalified procedure because a prequalified procedure would require a vertical up progression (See AWS-D1.1-2010, Clause/Sub-section 3.7.1). So the company you are working with must have on file a Procedure Qualification Record (PQR) for welding groove welds in the vertical position with a downward progression. #3) not staying within the preheat/interpass requirements of Table 3.2. So, long story short, if the company has written weld procedures for the Flat and Horizontal positions and has qualified the Vertical down progression, then Welders tested 3G down to a qualified procedure would be considered qualified (within the restrictions of Table 4.10). It has been my experience that it's pretty tough to qualify a multi-pass procedure 3G down. Not to say it can't be done. I've just struggled with it. Let me know if the procedure was qualified… That’s kind of a big deal. Thank you for your response. Believe me you haven’t heard the last of me. I’ve been looking for someone to answer my questions , and I usually have a lot of them. Unfortunatly I’ve made a mistake thinking you could weld GMAW down and it would be prequalified. I’ve contacted the company and explained the problem. I have a date to retest them either vertical up or just doing fillet joints which is all they need anyway. I guess it’s one of life’s lessons. I should read more and not listen to others. Which is more dangerous, Nuclear Welding or Underwater Welding? 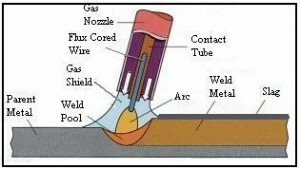 Often, when we use the term Nuclear in welding we are talking about high weld quality. Nuclear welding can be carried out in a fab shop miles from a Nuclear Power Plant, or right there on site during construction. In these cases, Nuclear implies highly skilled workers doing welding that will be Radiographically (RT) or Ultrasonically (UT) tested to a very strict code. Welds need to be free from defects; fit-ups need to be accurate and free from added stress. Pipe and fittings need to be manufactured in such a way as to be traceable as do welding consumables such as electrodes and welding rods. To be a Welder on a Nuclear job site requires high skill. A failed X-Ray can cost big money and probably your job. Underwater welding brings images of a diver striking a shielded metal arc weld (SMAW/Stick) on some moss covered oil platform deep in the Gulf with Scuttle hovering over head and Flounder swimming by. Like Nuclear, underwater welding also requires a high degree of skill. The cost of getting a skilled worker to that repair is high and everybody involved has a “fix it once, fix it right” attitude. I once watched as a welder had to submerse himself in to a 24 in. diameter bridge footing form to re-weld a damaged piece of re-bar. That was a spendy repair. 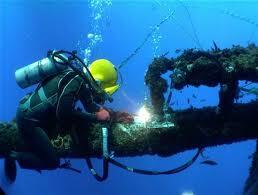 In addition to being a skilled Welder, the underwater Welder needs to be a skilled diver. 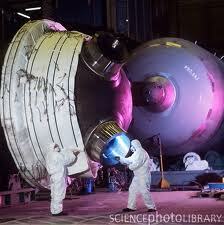 They need to be able to manipulate the welding electrode while dressed in an outfit reminiscant of Neil Armstrong. He/She may work directly in the water “wet welding” or do “hyperbaric welding” (dry welding) where a positive pressure enclosure is attached to the hull of a ship. The water is removed from the chamber and the Welder is in a dry environment deep below the surface. So the Underwater Welder sounds as though he would have the more dangerous job, but did you know there is such thing as an Underwater Nuclear Welder. This dude has to suit up, climb into the cooling pool that is filled with 100 degree, radioactively contaminated water, and complete a weld repair. All these Welders require a high degree of skill. 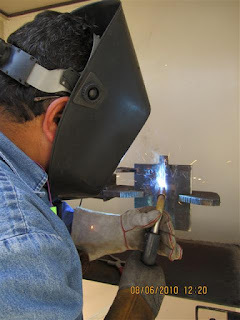 Not just in welding, but in several other categories, diving, working in confined space, working with restrictions on your hands, your legs your sight, working with an oxygen supply, and climbing, climbing, climbing. Which brings me to the Welder who has the highest chance of a fatality on the job; five or fifty stories up, walking an I- beam, attached to a 6 ft. tether, dragging a “beamer” close behind. 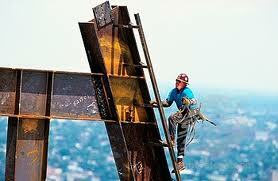 I believe statistics show, the Iron Worker is the Welder who is most likely to suffer a fatality on the job. It’s good work if you can get it, but pay attention to your Trainer and be careful. Somebody expects you home tonight.